The Food and Drug Administration currently prohibits the interstate sale or distribution of raw milk and raw milk products, such as yogurt, ice cream, cheese, and sour cream, and requires anyone selling raw milk to be licensed. The FDA delegates all further regulation to the states by advising them to likewise regulate the sale and distribution of raw milk. Based on this advice, 40 states prohibit the retail sale of raw milk and raw milk products, of which 13 states make unpasteurized dairy products completely illegal for human consumption. Though they have the potential to make people sick if they are not prepared carefully, unpasteurized dairy products carry health benefits--especially for those people who are sensitive to lactose or have allergies. Kristin Canty, director of the documentary Farmageddon, told us, "My son was completely ridden with allergies and asthma until we started drinking raw milk as a family. We have been drinking it now for 15 years. I find it ridiculous that the government thinks that they have the right to tell us that we can't consume a substance that has been used for sustenance for thousands of years." Dan Allgyer, an Amish farmer in Pennsylvania who violated the FDA's ban on interstate raw milk sales, was subjected to an early morning armed raid of his farm which put him out of business. Milk from Allgyer's now-closed farm was never alleged to have made any of his customers in the Washington, D.C. area sick. Rather, his customers sought out his dairy products, fully aware that they were unpasteurized. The FDA and Centers for Disease Control and Prevention are determined to educate the public on the perceived dangers of raw milk, but their data suggest that raw milk is not as dangerous as their slanted language implies. 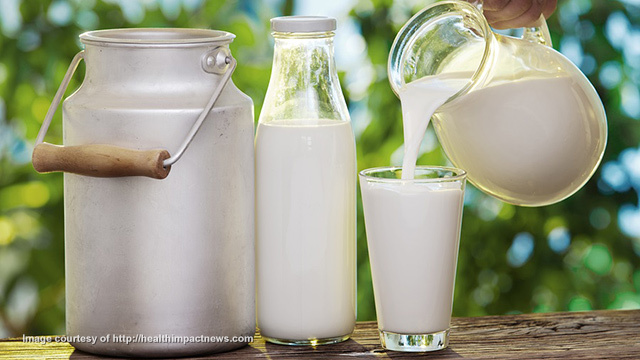 In its video explanation of the dangers of raw milk, the FDA claims that, "healthy people of any age can get very sick or even die if they drink contaminated raw milk." This is not news--healthy people of any age can get very sick or even die if they drink or eat any contaminated food. All products carry risks, but that does not necessarily mean that their sale is prohibited. Consumer freedom would be substantially limited if only fully-cooked chicken breasts or well-done steaks were available for sale. The CDC states that "While it is possible to get foodborne illnesses from many different foods, raw milk is one of the riskiest of all." Yet newly-released CDC data show that, from 2007 to 2012, there were a total of 81 reported outbreaks associated with unpasteurized milk and that these outbreaks resulted in 979 illnesses, 73 hospitalizations, and 0 deaths. 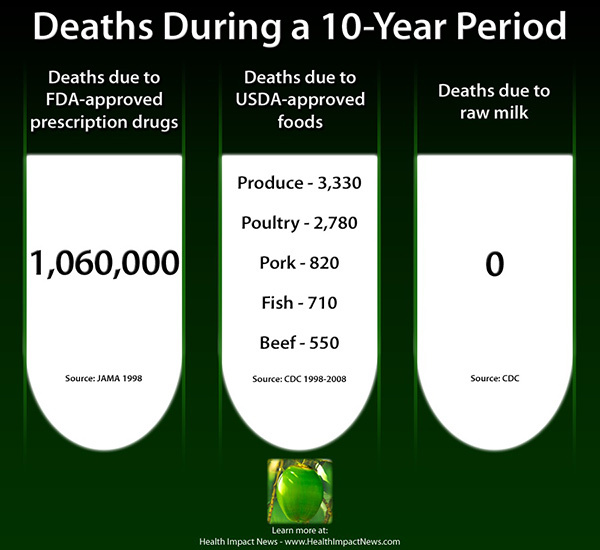 Over a five-year period of relatively wide consumption, raw milk did not kill a single person, even though it is estimated that in California alone 100,000 people drink raw milk weekly. Even if the CDC and FDA were correct in stigmatizing raw milk for its potential dangers, the market is already able to protect the public against another food that is often seen as potentially risky--raw fish. Currently, the federal government has no regulations concerning which fish can receive the designation of "sushi grade," meaning it is expected to be consumed raw. In other words, a gas station vendor could buy low-grade fish from the nearest waterfront and label it "sushi grade." But people would be hesitant to purchase raw fish from a gas station that they do not trust. Further, a business will not stay open for long if it disappoints its customers, much less if it makes them seriously ill by selling tainted food. Without being told by the government to do so, stores tend to reserve the best quality, cleanest fish for the label "sushi grade." These sales operate without regulation and without sacrificing public health. Companies selling raw milk likewise regulate their own products in a manner that protects the health of their consumers. Ten states allow retail sales of all types of raw milk, and more allow on-farm sales. Despite warnings from the FDA, there is no massive public health crisis in the states that allow consumption of raw milk, compared to those that do not. What started as a reluctant and reactionary ban on unpasteurized dairy sales, which was spurred by a 1986 Public Citizen lawsuit, has turned into an all-out FDA assault on raw milk products. In an attempt to remedy this administrative overreach, Rep. Thomas Massie (R-KY), a cattle farmer, introduced two bills last legislative session that would ban federal interference with interstate raw milk sales, though it would not affect state bans. Neither of the bills gained much traction. When we asked Congressman Massie why he thought this was so, he told us, "When I first introduced the legislation, I didn't realize the lactose lobby would be so intolerant." He plans to reintroduce the bills this session, and mounting public demand for unpasteurized diary may allow future bills to receive a vote. Weighing the benefits of raw milk, and other foods such as lettuce and shellfish, against the risks is an individual choice that the government should stay out of. For some, drinking raw milk may not make sense. For others, the flavor and the health benefits might outweigh the associated risks, especially when purchasing raw milk from a trusted source--whether that be a family friend, a local farmers market, or a reputable retail store. Instead of creating and enforcing regulations which ban products when there are not substantial threats to the public, government agencies should leave people and the food that they choose to consume alone.